The upgrade consists in the replacement of the entire cutting unit with a new, more efficient model, easier to maintain. 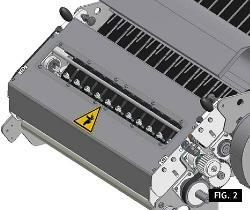 The new group differs from the previous version for a lot of points, including the addition of a brushless motor dedicated to the rotation of the cutting blade and the possibility to open the housing area of the knife and rubber rollers by means of a hinge system and pressure spring designed for this purpose. Thanks to the installation of this motor, the rotating speed of the blade becomes independent from the speed of the film climb belts: as a consequence, the edge of the cut looks sharper and without fraying; moreover, the cutting operation is more reliable and efficient, also with thicknesses that were problematic with the old clutch system. The new group minimizes the maintenance costs and time, thanks to the elimination of the electro-pneumatic part that tends to lose efficiency over the time and requires frequent maintenance and adjustments, in order to ensure top-level performance. 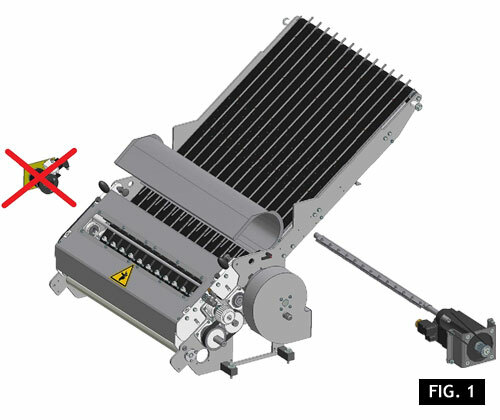 The use of the motor instead of the clutch has eliminated any inefficiencies due to delay in response times of the components, such as the clutch opening spring, the activation valve and the locking cylinder. In order to make maintenance operations easier and in order to ensure a longer life of the cutting group, the restyling introduced new materials and new surface treatments against corrosive agents, such as rust. Some surface treatments also increase the machine hygienic level, by making the cleaning operations easier. In case this product were taken into consideration for a machine manufactured before the year 2005, there is another important improvement of the functional group ZF010007/8, as compared to the old version installed on the above mentioned series of machines: the knife hinged opening. As a consequence, it is easier to intervene on a rubber roller or to replace the cutting blade. The blade area is also integrated with a window which makes the group inner parts visible, while it is operating, without affecting the safety levels thanks to a transparent protection. As a consequence, it is possible to follow the cutting process and point out any anomalies from the privileged point of view offered by this window. Database to be provided, in order to update the machine parameters. - Easier and faster maintenance operation.